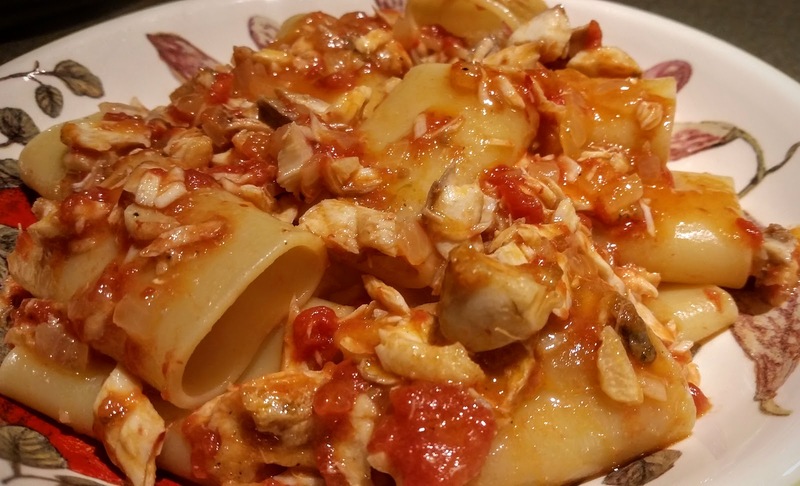 I never thought of a fish-based ragù before, but I enjoyed this dish so much on my recent trip to Italy, I thought I would try it at home. It turned out so well that this dish will certainly be a regular at our dinner table. The first question to deal with was what kind of fish to use. I wanted a fish that would flake, but also hold up in the sauce without disintegrating into indistinguishable bits. I estimated about a two-pound fish would be the right size. At the fish market, I settled on a striped bass. I think this dish would work well with many types of fish, but while the striped bass may have been a safe choice, it was also delicious. I got the fish market to scale and gut the whole fish; I filleted it at home and saved the head and bones for stock. I already had some good fish stock on hand in the freezer. If you don’t have fish stock, it is simple to make but will add time to the preparation of this dish. To make fish stock, throw fish bones and heads into a stock pot. Cover with cool filtered tap water. Add an onion cut in half, a carrot cut in one inch pieces, a celery stalk, a couple cloves of garlic, bay leaf, a few black peppercorns, some salt, sprigs of thyme, and parsley. If you have shrimp heads or shells or lobster shells, add them. If you cooked some mussels or clams, save their juice and add it. Simmer for several hours until the broth tasted good enough to eat on its own. Strain, and then run a bit more water over the strained solids to get every bit of goodness. When I make stock, I make some extra to freeze. You never know when you might want to make a chowder or paella or poach a whole fish. 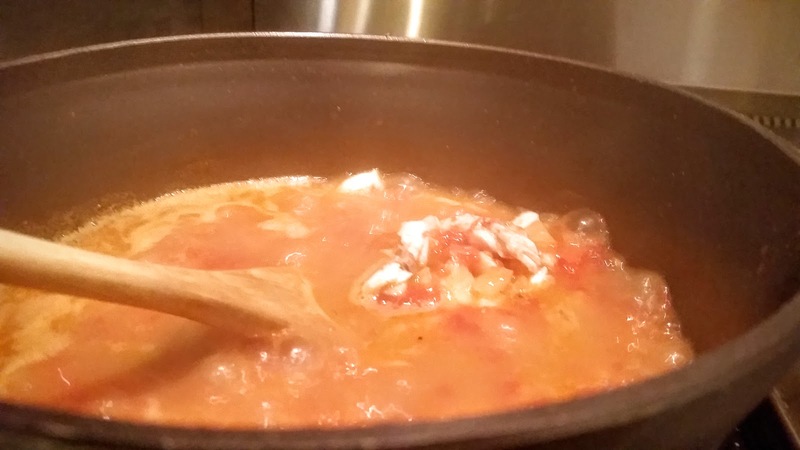 I put a quart of fish stock and a pint of home canned San Marzano tomatoes in a sauce pan and set it to a low boil to reduce. Reduce this pan until it is about half the original volume and begins to thicken. The tomatoes will break down, but you still want some small pieces of tomato in the sauce. The past several years, when I can tomatoes, I have added a few basil leaves to each jar. I find it adds a brightness to the tomatoes. The basil of summer is the best, so what better thing to punch up the best tomatoes than an aromatic basil top? If you are using canned tomatoes, you can add a couple of basil leaves to this pot. Since the fish stock was already seasoned, I added no more seasonings to the sauce. Taste yours and season it if needed. Next, I pan seared my fish fillets in a carbon steel skillet with a bit of olive oil. The fillets were seasoned with a bit of salt and pepper. Sear skin side down first. When the skin is crisp and brown, carefully flip the fillets to brown the other side. Remove the fillets from the pan and allow to cool enough to handle. Add a bit more oil to the pan and sauté half of a finely chopped onion and 2 cloves of minced garlic. When they are soft and just starting to brown, add them to the sauce pot. 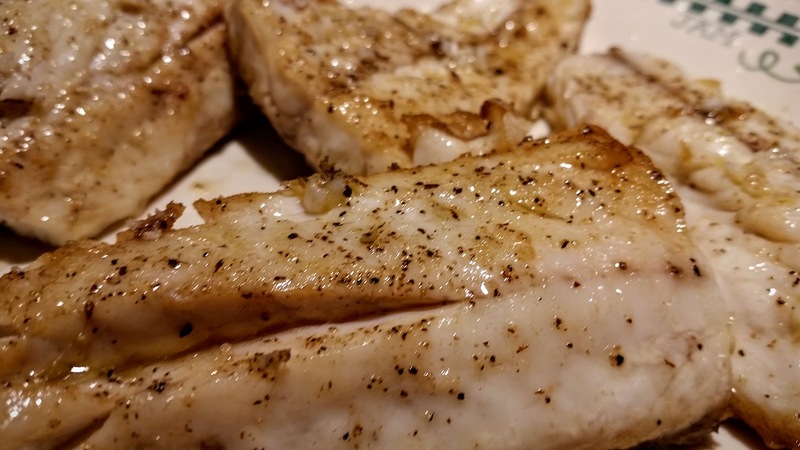 Remove the skin from the fish fillets, and break them into bite size pieces. Discard the skins (or use in your fish stock pot), and add the fish meat to the sauce. Finish the sauce with 1-2 tablespoons of dry vermouth or wine. This will add a little more acidity to the dish to perk it us. You can also use lemon juice here, but be careful not to get to assertive with lemon. 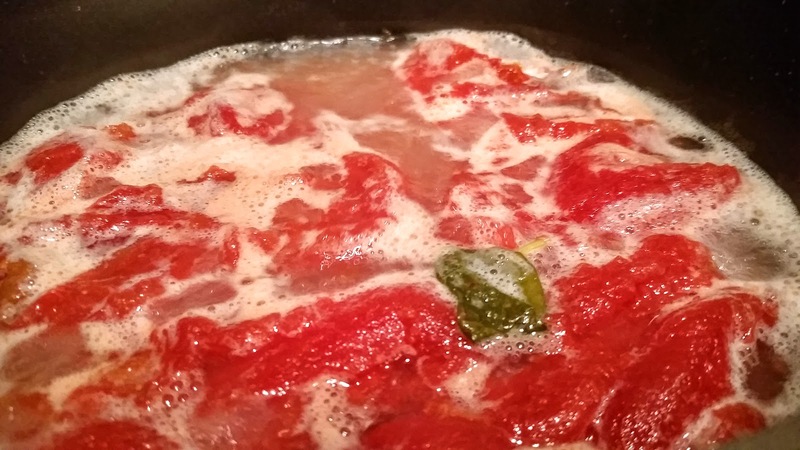 The richness of the fish stock and the freshness of the tomatoes are the stars here. 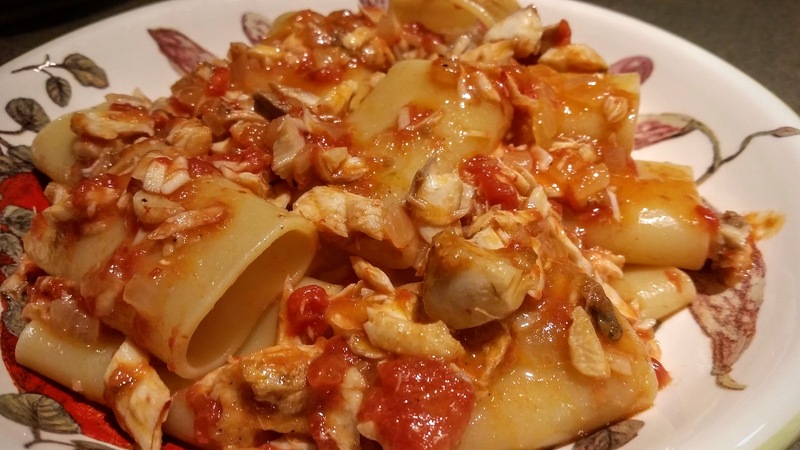 The sauce should be fairly thick now, but add a tablespoon of butter to thicken just a bit more and make the sauce adhere to the cooked pasta. 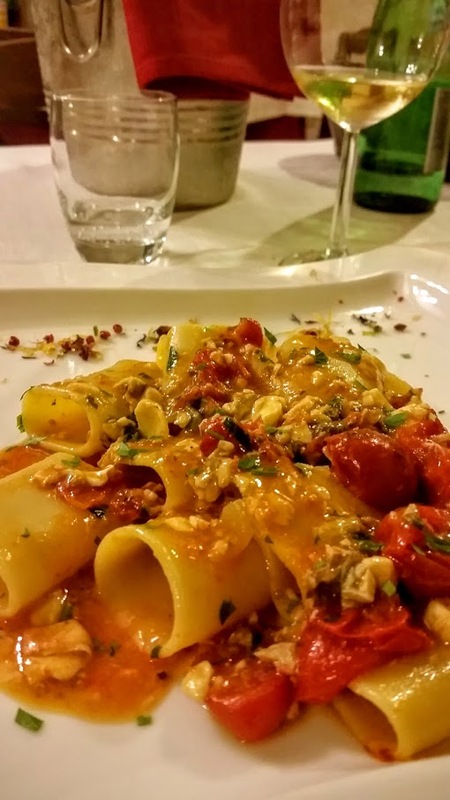 On my recent trip to Italy, I traveled to Caserta in Campagna, and I was introduced to the local pasta di Gragnano. 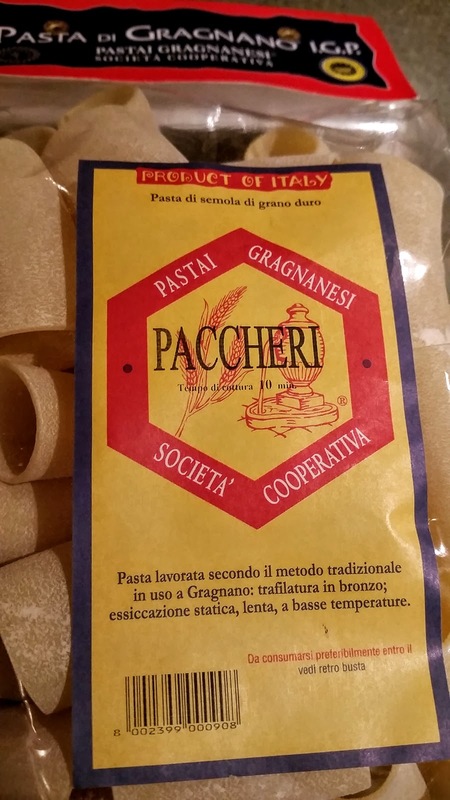 I was told that the methods used to produce this pasta are special, allowing large tubes of Paccheri to stand up even after cooking. I cooked a bag of Paccheri from Gragnano to al dente in 10 minutes, drained the pasta and added back into the pasta pot. I dressed it with a bit of the sauce, enough to coat all surfaces. Then plated each guest a nice serving with a bit more sauce dressed on top.